Six years ago, the Paul Hamlyn Foundation set out on an ambitious quest. 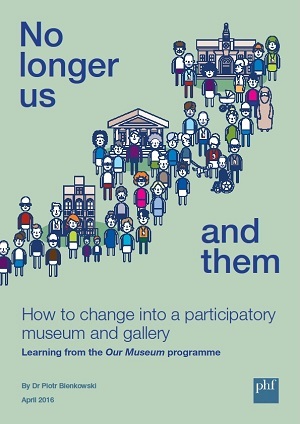 They wanted to help museums and galleries across the UK make significant, sustained changes in the ways they engage community partners and visitors as participants in their work. The result, Our Museum, is an extraordinary funding program with a focus on community participation. In its first five years, Our Museum yielded real change at twelve diverse UK organizations. Our Museum also produced a suite of online resources and reports that are impressive, honest, and comprehensive (though a bit tricky to navigate--I recommend using the search function). You could spend a day getting lost in the meaty, thoughtful writing and videos on the Our Museum site. I recommend starting with the final report, No Longer Us and Them. Our Museum started with a clear-eyed assessment of community engagement funding and practices across the UK. Dr. Bernadette Lynch's provocative 2011 report, Whose Cake is it Anyway?, didn't mince words. While there was evidence of plenty of community engagement work across museums and galleries, most of it was funded project by project. Most participatory projects were short-term, siloed innovations, not institutional transformations. And in several cases, the projects constituted "empowerment lite" for participants rather than true collaboration, co-creation, or transformation. Five years later, project director Dr. Piotr Bienkowski's final report for Our Museum tells a different story. No Longer Us and Them describes organizations that have changed dramatically, from top to bottom and across program areas. I strongly recommend you read the report. 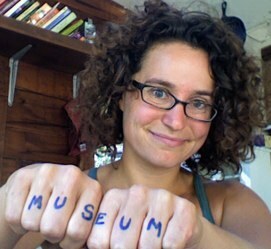 Extra credit if you read the Our Museum evaluation (or its summary) as well. Here are my three top takeaways. These two lessons are probably true of any major institutional change process (swapping the word "participation" with the focus of the change). Many of the barriers to participation identified in the report--lack of committed leadership, conflicting strategic agendas, silos, staff resistance, lack of capacity, fear--could apply to any change process. The evaluation additionally called out some faulty assumptions in program design about leadership and staff continuity throughout the multi-year process. Disruption can be confusing, destabilizing, and potentially derailing, no matter the focus of the transformation at hand. Interestingly--for good and ill--this transformative funding program coincided with a national funding crisis in the arts in the UK. This made the work more urgent, fragile... and realistic. Most major change doesn't happen when things are going well. While a funder can have impact in directing organizational leaders to turn their heads in a particular direction, it's often negative externalities--financial pressure, political changes--that spur organizations to significant action. The financial austerity measures applied external pressure to the Our Museum institutions. While that was painful for the organizations involved, it also helped force the issue of whether participatory engagement could be core to a strong future business model for each organization or not. It upped the stakes on change--something a funder could not provide alone. Community partners, artists, peers, and funders all play different roles as collaborators and contributors to participatory institutions. My favorite section of No Longer Us and Them is the discussion of the specific value and roles of each type of outside contributor (scroll down in this document for a helpful visual representation). In particular, Piotr calls out "critical friends" as helpful external partners. Critical friends are trusted outside observers who may raise tough questions and uncomfortable truths that a collaborating community group cannot or will not share. Critical friends are positive, constructive, and able to tease out real challenges. As this video points out, critics make you swear. Critical friends can make you smile. Piotr also notes that artists, while excellent at providing fresh perspectives on an institution's work, may not be the most helpful or well-received when it comes to providing more formal feedback or participating in reflection and shared learning sessions. While I don't fully agree with all the role designations in the report, I appreciate the nuanced insight that different types of outside contributors bring different expertise and value to the table. No Longer Us and Them's magic ingredient is honesty. That honesty shines through in the report's clear language, specific tips, and frequent bite-sized notes of "things to watch out for" when working to become a participatory organization. Indicated with a bold exclamation point, the "things to watch out for" are warning signs and traps to avoid. Some feel small and specific--"be sensitive to staff body language in meetings"--whereas others are more strategic--"be clear about your starting point when you approach communities." In all cases, I found these warnings to be refreshing, educational insights that taught me more than any success stories could. In summary: read the report. Check out the Our Museum online resources. Consider your own path to institutional transformation. And consider sharing a comment here with a takeaway that is meaningful for you. If you are reading this via email and would like to share a comment or question, you can join the conversation here.